If you are a bereaved parent, grandparent or adult sibling (must be 18 y/o or older) please join us for our March 6th meeting, 7pm prompt start. We are so pleased to host singer/songwriter, motivational speaker, retired executive director of TCF and last but not least, bereaved dad to Ashley- Alan Pedersen. 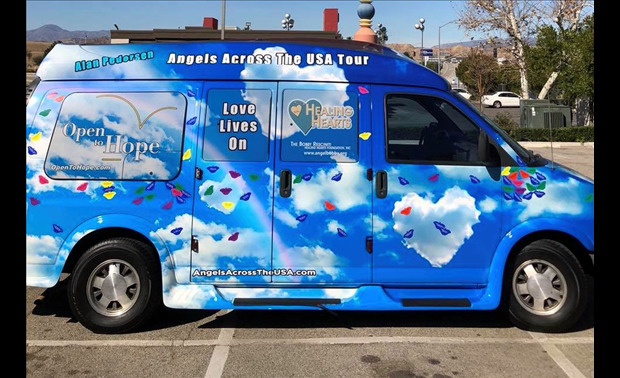 Alan is on his national tour, visiting as many TCF chapters across the country as possible- his mode of transport...this special van. He will speak with us and share some of his songs. No charge- but he will be selling CD's and angel stickers, should you like. Alan funds his travel by these sales but asks nothing from the chapters or attendees. Questions, call Karen at 513-207-8714.